The current study reports for the first time an application of orography from the Cartosat-1 satellite digital elevation model (DEM) generated at a source resolution of 30 m in a convection-permitting numerical weather prediction model. The effects of improvements in the representation of orography have been examined in the high-resolution regional National Centre for Medium Range Weather Forecasting (NCMRWF) Unified Model predictions for a heavy rainfall event over the city of Chennai. A time-lagged ensemble method is employed to account for the uncertainties associated with the initial conditions, which can better forecast extreme weather events than single forecasts. 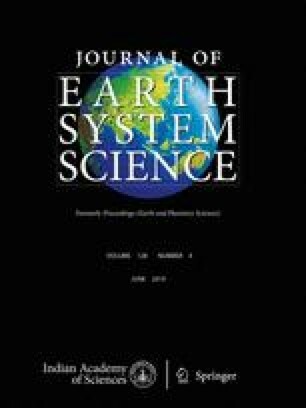 The simulations reveal that the predictions based on Cartosat-1 DEM capture the local details of the rainfall distribution better than the National Aeronautics and Space Administration shuttle radar topography mission DEM-based predictions, and better represent the orographic and thermal uplifting. The spatio-temporal patterns of the simulated rainfall over Chennai are superior in Cartosat-1 DEM-based simulations mainly due to the enhanced wind convergence and moisture transport. The present study reveals the role of mountains in the enhancement of heavy rainfall events over coastal cities and highlights the potential use of high-resolution orography in the improvement of the operational weather forecasting skill of the NCMRWF Unified Model. The authors gratefully acknowledge Dr Stuart Webster, Met Office, UK, for his valuable comments and discussions. They acknowledge the data source CartoDEM Version-3 R1, National Remote Sensing Centre, ISRO, Government of India, Hyderabad, India, NASA for the SRTM and GPM IMERG products and the JAXA GSMaP rainfall product. Yadav S and Indu J 2016 Estimation of vertical accuracy of digital elevation models over complex terrains of Indian subcontinent; Int. Geosci. Remote Sens. 6036–6039, https://doi.org/10.1109/IGARSS.2016.7730577.